Like so many women, she believed the painful thought that she would need to settle in order to get the kind of partner she desires for her life. And all of it was holding her back from the getting the kind of relationship she desired. It was her own fearful thoughts that were keeping her stuck in her painful stories. It was her underlying beliefs about herself and what was possible that kept love at bay. And it was the lies she had come to believe that kept her moving from relationship to relationship, sabotaging opportunities and continually hiding her heart. Once Cathy was brave enough to question those thoughts and beliefs, they loosened their grip. Once Cathy could see these beliefs as the untruths that were keeping her from the relationship she desired, new possibilities opened up for her. Once Cathy could see the truth about her role in the creation of her own experiences, she had the tools to create a future experience in love that looks dramatically different than her past experiences in love. 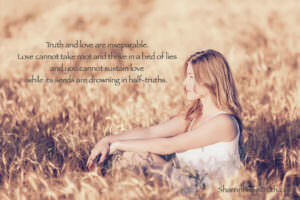 Truth and love are inseparable. Without the truth, there’s nowhere to go, and there’s nothing to work with. Love cannot take root and thrive in a bed of lies, and you cannot sustain love while its seeds are drowning in half-truths. In our most intimate relationships, we can unintentionally allow our emotions, fears and wounds from the past to cloud the truth and keep us from the love we desire. We stay stuck when we stop with the story that’s easy to tell (”I’m not good at love”), rather than the story that’s real and raw, truthful and transparent. Once we can gently and compassionately challenge and see past the lies we didn’t know we were carrying, we can stop the maddening act of desperately searching for love and instead, become love.